She makes dinner. She does windows. She reads bedtime stories. She's a blessing... in disguise. In Mrs. Doubtfire, Robin Williams plays a man going through a tough divorce. He is very upset by the thought that he will not be able to see his three children as often as he used to. His now ex-wife, who is dating somebody new, sets out to hire a nanny for the children, and Williams springs into action. He applies for the position himself, posing as an elderly British woman named Mrs. Doubtfire. 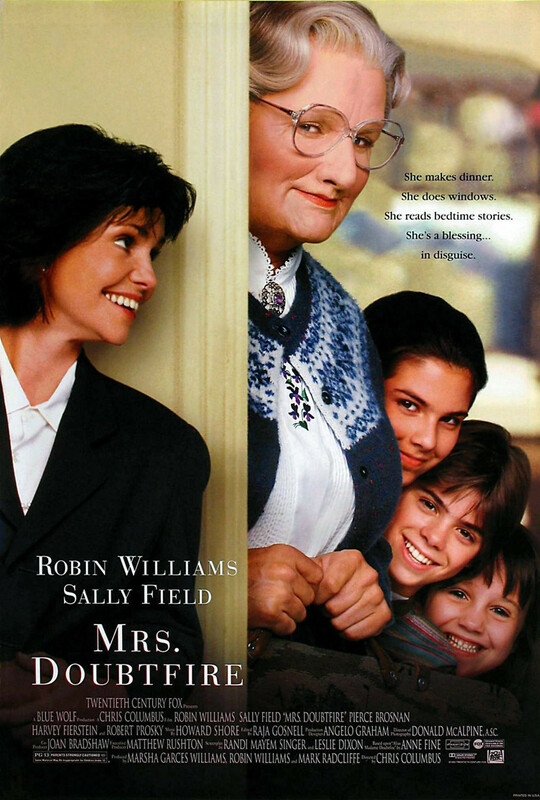 Everyone in the family ends up loving Mrs. Doubtfire, but it is a bitter victory, as Williams realizes he wants his children to love him for himself. His true identity is revealed, and the ex-wife eventually lets Williams watch the kids as often as he likes, without the Mrs. Doubtfire costume.